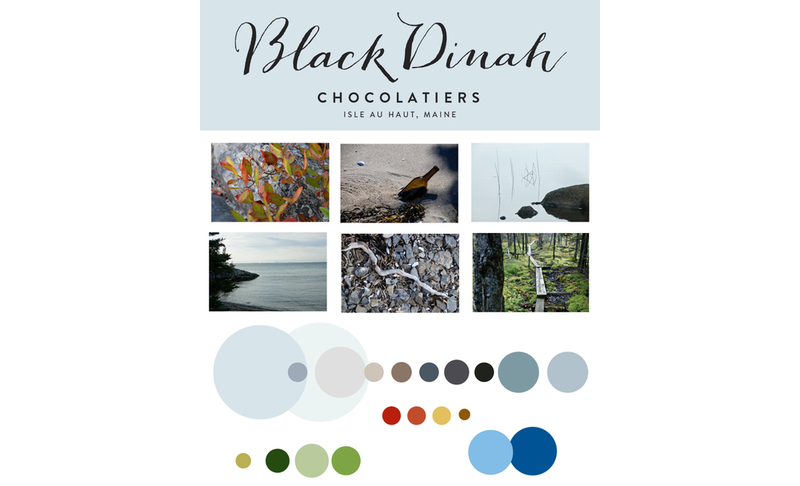 Black Dinah Chocolatiers, a chocolate company based on an island off the coast of Maine, started in the Spring of 2007; today this company has won more awards than you can shake a stick at, is exploring partnership with national retailers, and garnering widespread interest from Martha Stewart Living magazine to Ruth Reichl. 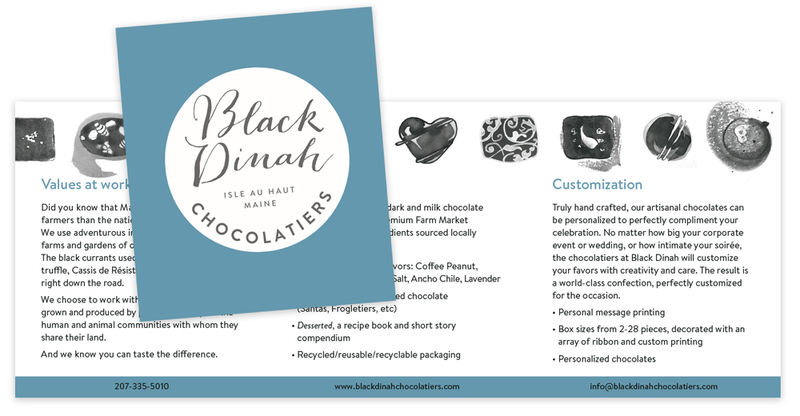 In 2014, looking to explore a larger national market, Black Dinah was ready to update their brand. While previously the brand was focused on a pirate narrative, and the color palette was focused on the browns and creams of chocolate, a more authentic expression of their brand would be the beauty of Maine, with the blues of the ocean and the bright colors of turning leaves in the fall. I redesigned their logo, created a new color palette based on Maine colors, and created visual brand elements for use in collateral. ...and translating them into standard values for print and web. 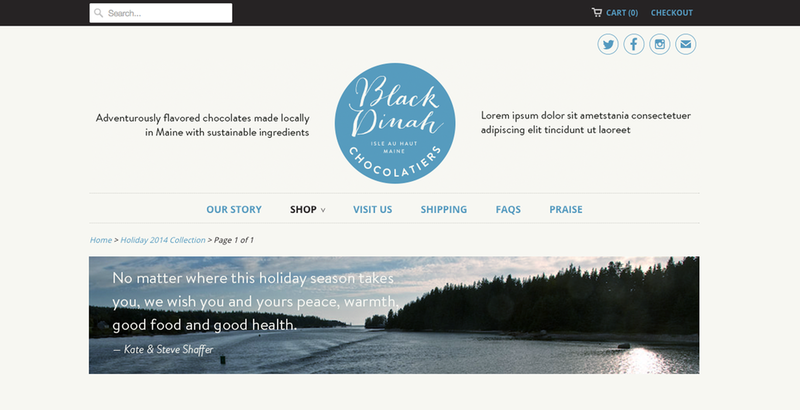 Header, top navigation, and carousel image design (Wordpress & Shopify), as part of the newly designed website, was a seismic shift in their website strategy and branding. Created with Lisette Sacks, brand strategist/art director extraordinaire. 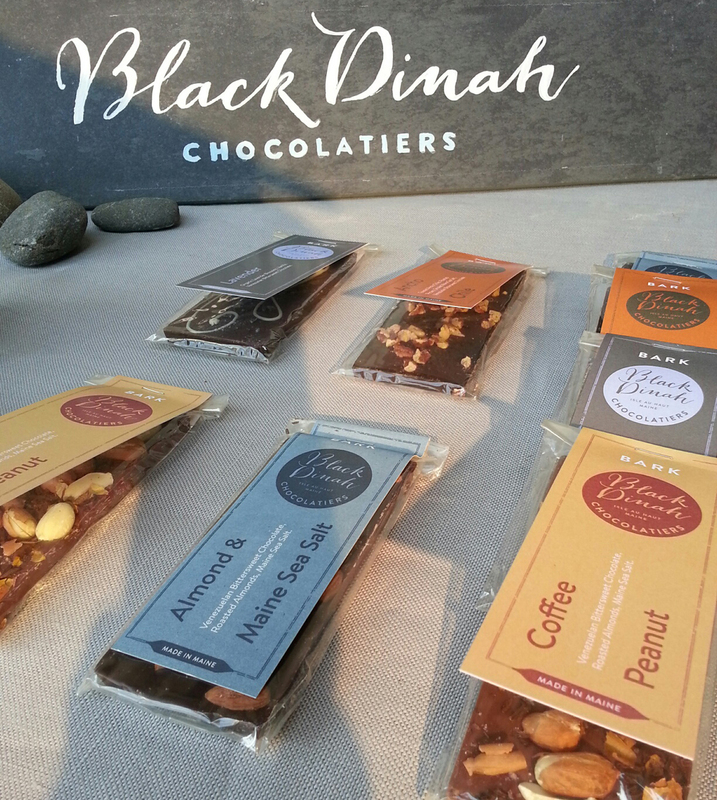 When Kate (left) and Steve (center), co-owners of Black Dinah Chocolatiers, came to San Francisco to receive a Good Food Award, I (at right) created and produced their booth for an invitation-only trade show. Close up of chocolate bark labels and painted slate sign for the booth. The Farm Market Collection is a special box of truffles using fresh ingredients from local farms. We wanted to set it apart from the regular collection, so we employed a secondary branding with its own identity. Like the regular truffle collections, these truffles are depicted with ink drawings to emphasize the hand-made quality of their product. The Cassis de Résistance won Best Confection at the Good Food Awards in San Francisco in January of 2015.